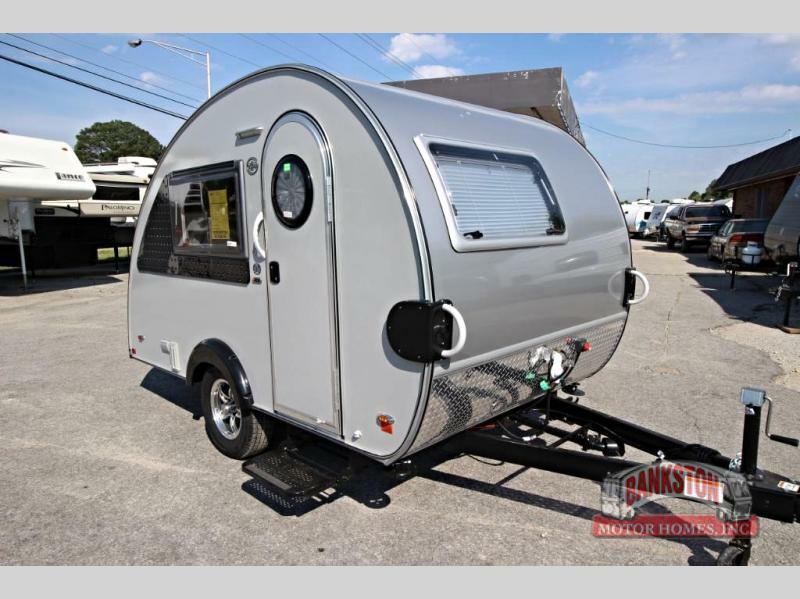 2017 Little Guy Worldwide TAB MAX S, 2017 TAB MAX S, Local Trade, Super Lite Weight With Rear Dinette, Front Kitchen And Bathroom. 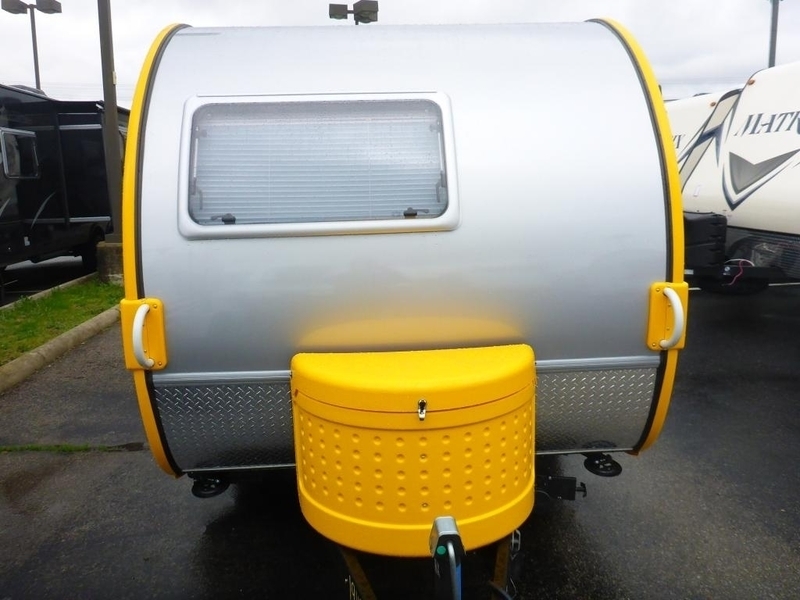 Many Options Include: Spare Tire, Aluminum Wheels, Paha Que Side Tent, High Output Roof Vent, Air Conditioning, LED TV, AM/FM/CD Stereo, Cook Top, Microwave (Loose), Norcold Refrigerator, On-Demand Water Heater/Heater And Much More! 2017 Little Guy T@G SILER SHADOW SE 2017 T@G SILVER SHADOW SPECIAL ED. 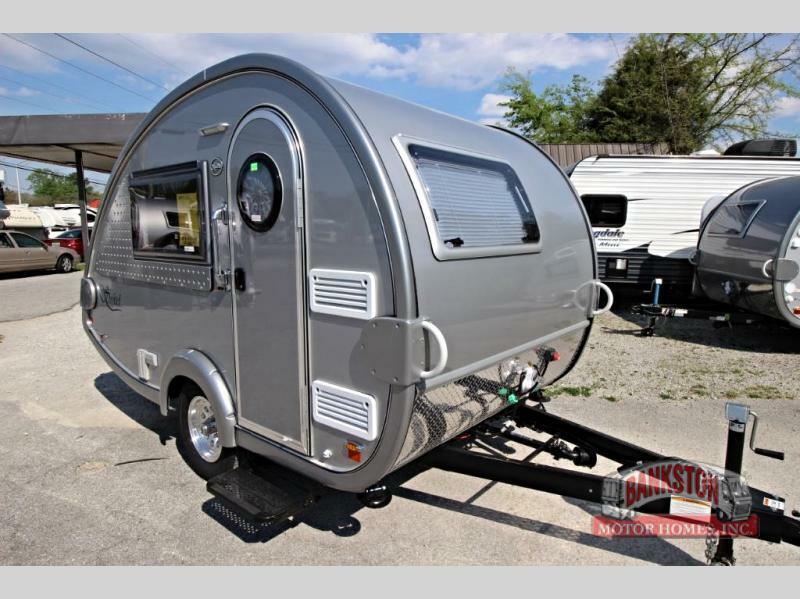 The 6x10 Silver Shadow teardrop trailer by Little Guy offers LED lights, 14" black steel wheels with baby moons, and fiberglass fenders. You can easily sleep two people in this trailer since there is a king size mattress. 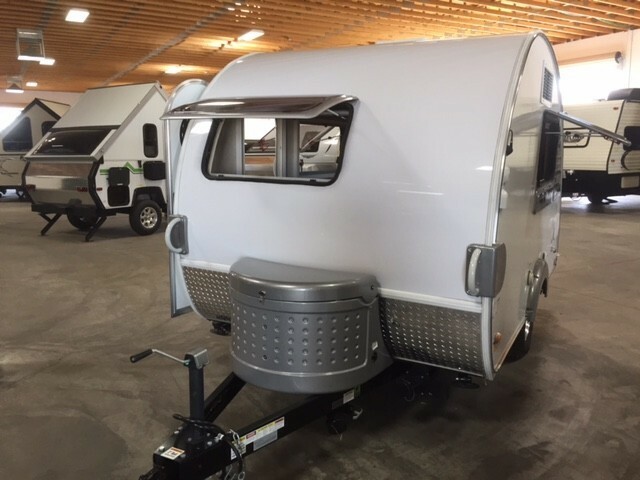 This trailer is also easily towed by any SUV.The rear hatch provides access to a galley with plenty of storage plus a standard sink, 12V/110 refrigerator, and two burner stove (in slide out drawer) making meal prep a breeze while you are traveling. 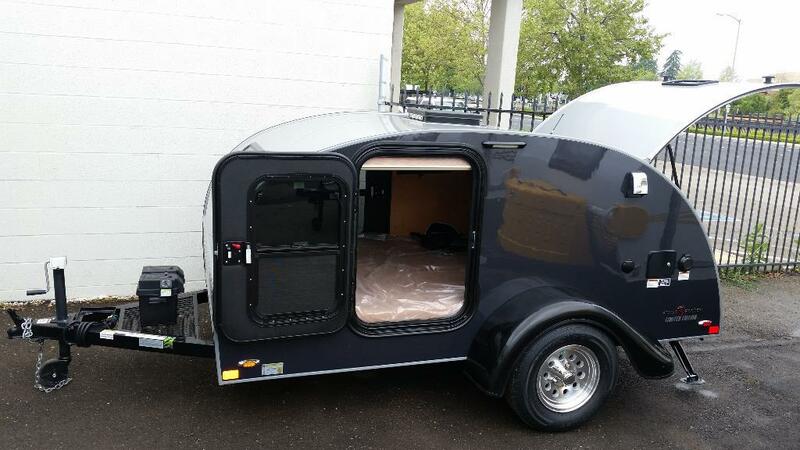 2018 Little Guy T@G MAX TEARDROP TRAILER 2018 T@G MAX TEARDROP TRAILER WE ARE THE FIRST TO HAVE THE 2018 T@G AND T@B TRAILERS IN NORTHERN CALIFORNIA!!! 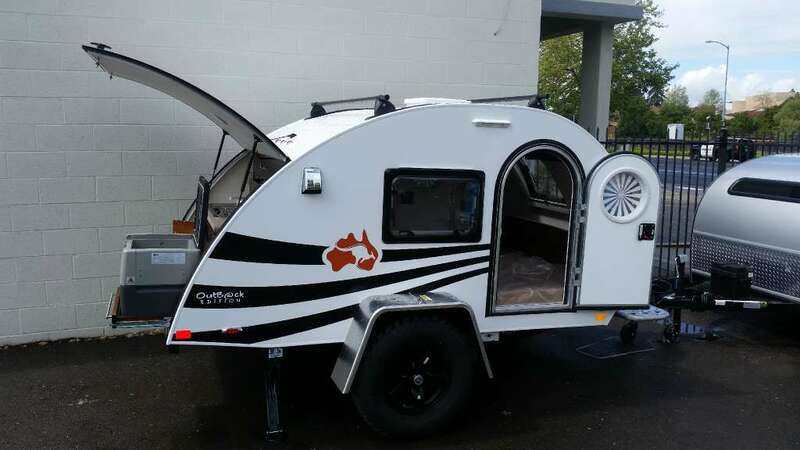 2018 Little Guy T@G XL OUTBACK 2018 T@G XL OUTBACK The T@G Teardrop Camper Trailer is a combination of it's older sibling, the T@B teardrop travel trailer and the classic teardrop trailer from the 1940's. 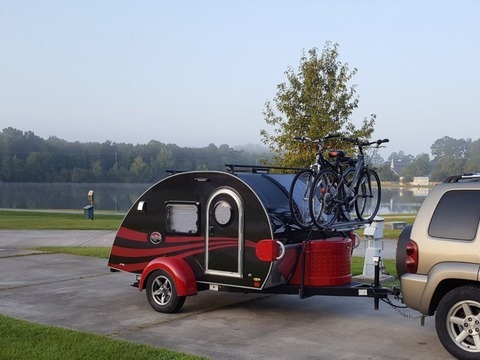 The T@G features the modern amenities, doors, windows and styling from the T@B and marries it with the classic teardrop shape and diminutive size. 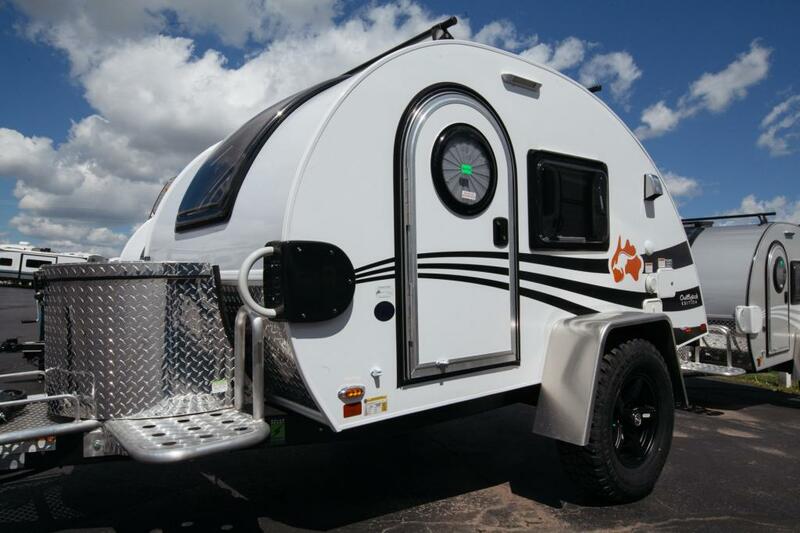 This 100% aluminum framed camper trailer sports a silver or white fiberglass exterior with colored graphics. The mini T@B doors are double locking and feature a portal window with circular blind. 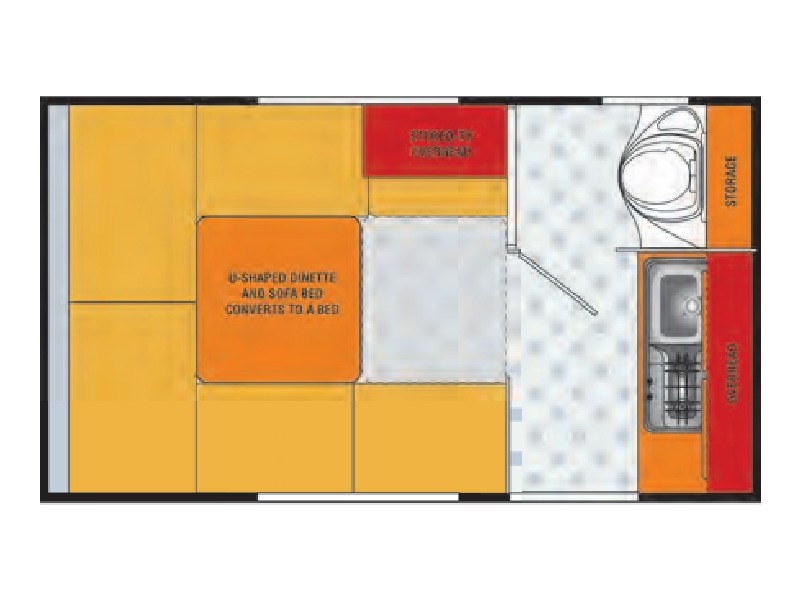 The trailer also features 2 mini-T@B style windows with screen/shades as well as a full galley in the rear with sink and stove. It includes a 3-speed, dual directional roof vent that ensures adequate ventilation. The fiberglass fenders match the graphics and meld seamlessly with the alloy mag wheels. The T@G also includes genuine wood cabinetry, LED lights and a high quality, padded mattress, as no corners are cut for quality. 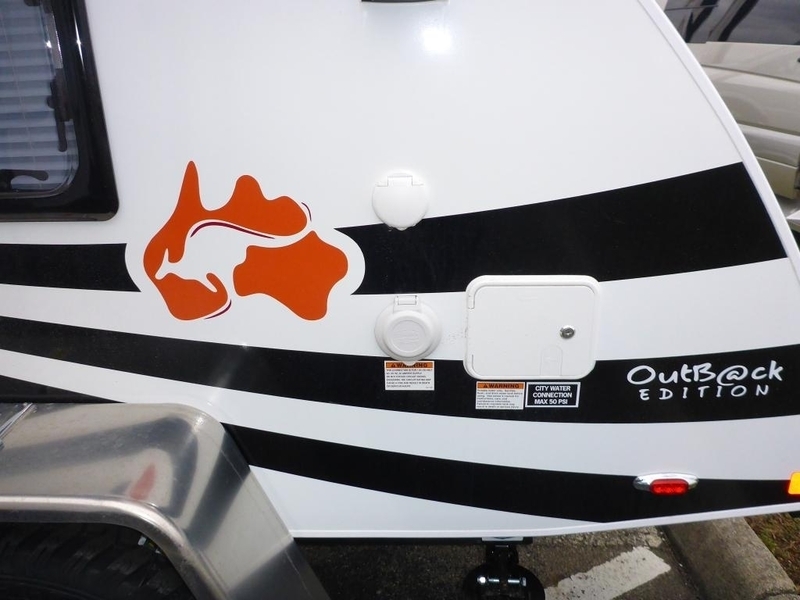 The tongue of the trailer features the T@B LP tank, which also houses the battery. A spare tire is optional and can be mounted under the tongue to blend out of sight. The galley also is set up for an optional fridge/freezer. 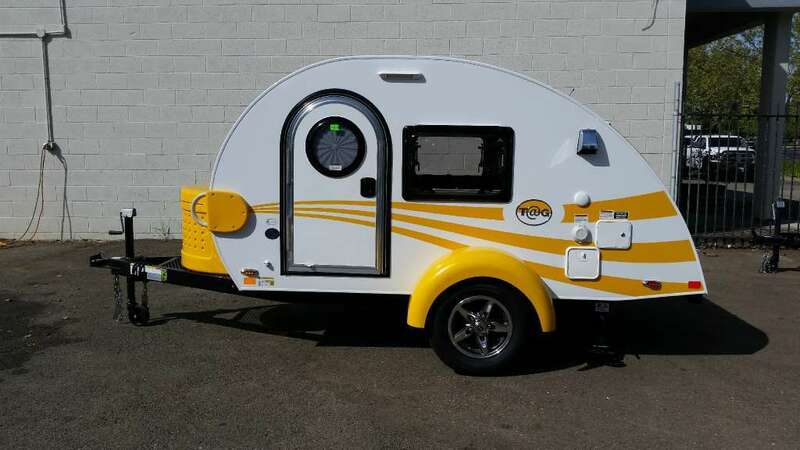 2017 Little Guy T@B TAB S, Call 480-894-1267 or email: sales@tomscamperland.com TAB S We stock all of our T@B trailers with the S MAX Package ( bathroom & fully loaded ) Thank you for visiting Tom s Camperland! The T@B S MAX Pack weighs 1700 lbs and is towable with many cars, trucks and SUV s! Sleeps two and is easy to maneuver! You can easily push the trailer around by hand! 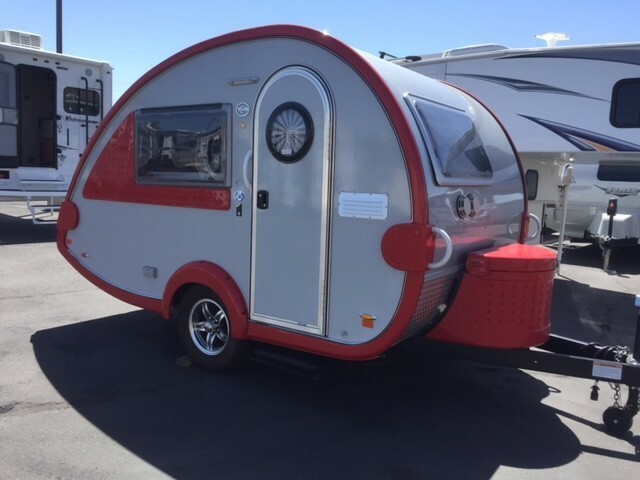 This trailer is loaded with the bathroom, shower, outside shower,3 way fridge, stove, sink, tv, cd, dvd, stereo,water heater, heater and much more! HIGH QUALITY tear drop trailer for Little Guy! Visit our new East valley location in Mesa, Az. 1301 W. Broadway Rd. Mesa, Az. 85202 Please email us, stop by for a tour or call 480-894-1267. Beautiful contemporary styled T@B Max S SOFITEL 2016 model barely used. Always covered with awning and cover included. Has a wetbath, 3 way fridge, 19' entertainment system, Alde heat system, airconditioning, two burner stove with glass top, sink with folding faucet, wetbath and all the SOFITEL custom upgrades. The wood cabinets are custom made by Amish crafters, all finishes are upscale with high end materials. The RV always gathers lots of attention and is so easy to pull, only 1,700 GVW. 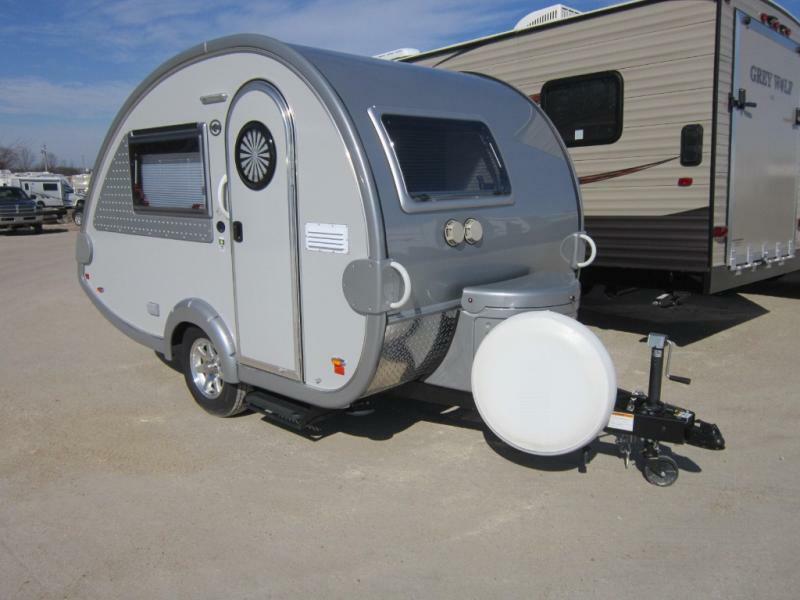 2011 Little Guy Silver Shadow Teardrop Camper. 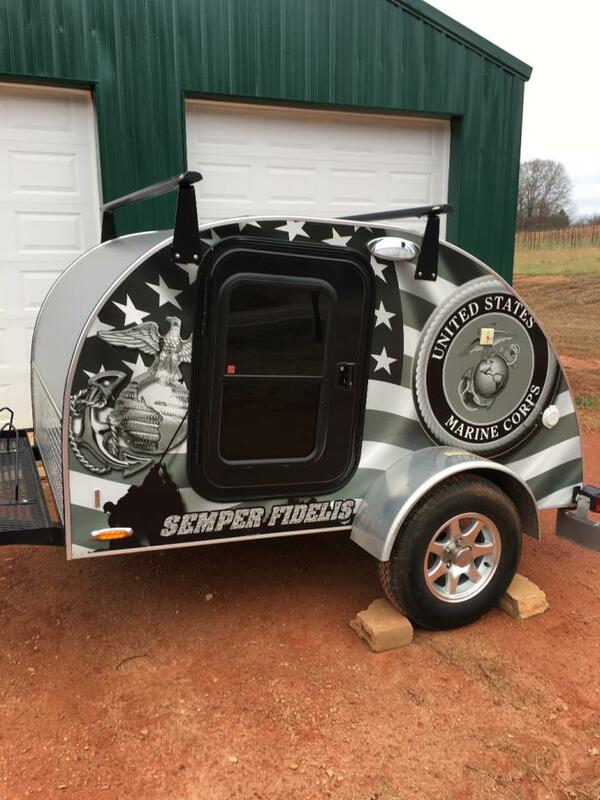 US Marine Corps vinyl graphics. 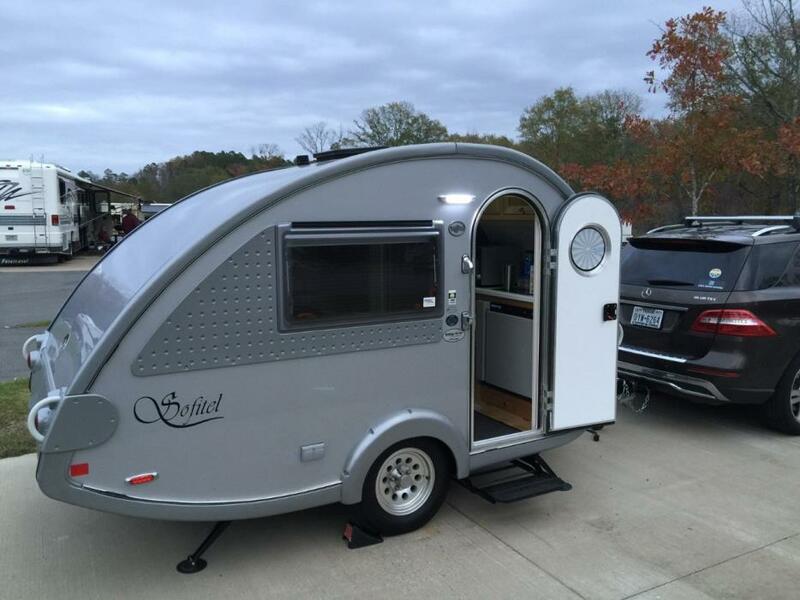 (This camper is featured in the slideshow on the home page of the Little Guy Teardrop Camper website, www.golittelguy.com. It was also featured in the Feb/Mar 2013 issue of MC2 The MINI Magazine.) Weighs about 1000 lbs empty. Easily towed by a MINI Cooper S. Has alloy wheels and aluminium fenders rather than the steel wheels with moon hubcaps and retro fenders usually on the Silver Shadow. Included a spare tire on an alloy wheel. Very comfortable queen sized bed. Small TV/DVD player. Galley in the back with a sink. Space for a small fridge or microwave. Luggage racks on top and on the tongue of the trailer. Rack to carry two bikes on the front storage rack. Mounting rack for two 20lb propane tanks. Modified water storage to hold 10 gallons. Also includes a cover, a portable heat/AC unit and a small changing tent.